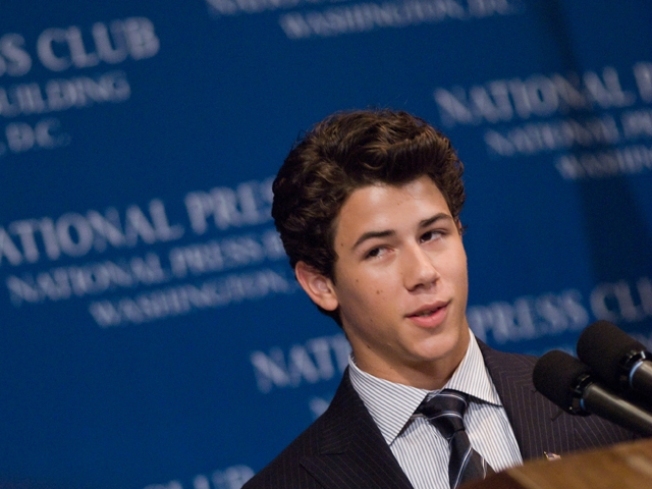 Nick Jonas discusses juvenile diabetes at The National Press Club. WASHINGTON -- Diabetes has never been trendier with the kids. The youngest Jonas brother -- Nick -- addressed a sold out crowd at a National Press Club luncheon Monday. The diabetic teen pop idol has launched a national campaign to help young people simplify life with diabetes. "I was not going to let diabetes slow me down, and to this day it hasn't," he said. "And at times, when blood sugar's high and it's low, it would be easier to just throw in the towel and say, 'Enough's enough, I'm done, and I'd like to just have a day off from diabetes,' but it just doesn't work like that." Teen idol Nick Jonas was in D.C. Monday to raise awareness about diabetes. Muzzled teeny boppers greeted Jonas outside the National Press Club with camera phones held aloft. They had been instructed not to scream, News4's Jane Watrel reported. Diabetes experts are thrilled to have such a high-profile star helping raise diabetes awareness. "Of the total number of individuals in the United States with diabetes, which is estimated to be somewhere around 24 million, it could be up to 5 percent that have juvenile or Type 1 diabetes," National Institutes of Health Diabetes Director Griffin Rodgers told Watrel. Jonas, 16, was diagnosed with Type 1 diabetes when he was 13. Since then, he has become a diabetes ambassador with Bayer Diabetes Care, for whom he has pitched a Contour Meter to manage highs and lows. He wrote "A Little Bit Longer" to inspire diabetics to live their lives to the fullest. His The Change for the Children Foundation -- co-founded with brothers Kevin and Joe -- gave $750,000 to diabetes research and treatment. In June, he came to D.C. to call for Congress to call for diabetes research funding, and in July, Kevin and Joe joined Nick in a charity softball game to benefit diabetes before the brothers took the stage at MCI Center. "He's a great role model because he's not just a singer and songwriter, he's also very inspirational to girls and boys that have diabetes, and I think that he makes a lot of kids feel better because he's also one of them," fan Madeline Stahl told Jane Watrel. "When I was younger, I didn't really understand it, but when Nick Jonas, when that came out that he had diabetes, it became a bigger idea to kids around the world," said fan Sinclair Daniels. Jonas said he has to do 10 to 12 blood tests each day. "I hope every day that my blood sugar's good before I go on stage, but sometimes it's out of my hands, and so, just always trying to be on top of it and know that I can do what I want to do with my life, I can live my dream out with diabetes," he said. Attendees of Monday's luncheon were eligible for free blood glucose and A1C testing from 11:45 a.m. to 3 p.m.